Sayabasachi Panda-whether you agree with his politics or not was a fearless fighter- who was with the masses for a long time with total commitment. Had he worked over ground he would have proved to be one of the outstanding pro people politicians of the state. Today’s global political situation which has globalized the coercive/violent power of the state will never allow any attempt to overthrow or even challenge a system which could be treated as violent. Most of the left radical outfits refuse to recognize this nature of the state which has become increasingly violent. What one needs today is a proper and ‘non-violent’ strategy even in the face of substantial state violence or violence by dominant forces. Violence in today’s situation will breed more violence and all at the cost of the common men. I have never seen this fighter even during his student days. I have heard a lot about him and therefore have got admiration for him though I don’t accept his politics and strongly feel that he would have been more effective had he chosen politics over ground. I must thank CM Nabin Pattnaik for not deciding to eliminate him. Had Modi been in his position we all would have heard the news that, “Sabyasachi Panda was killed in an encounter when he fired at a police squad”. I would request the CM to treat him with dignity as the Courts will take care of the trial process.Sabyasachi, as he gradually became desolate, physically weak and diseased, perhaps he realized what he needed to pursue a particular path which he could not afford now. This was the time for criminals in uniform to catch him and present him before the media hungry public that a big fish has been caught. I am told a fight is going on among Odish’s police officers while settling claims for the credit. Now they may even try to book him for the 9/11 attack on World Trade Center or for 26/11 attack in Mumbai’s Taj Hotel. 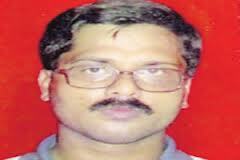 The writer is a senior journalist and activist based in Bhubaneswar. This note is taken from his Facebook wall. To promote forward caste hegemony/corruption/crimes in India, Modi regime is NOT implementing Reservations for BC/SC/ST/Minority communities in Supreme Court. Google “90% of corrupt money is with forward caste”.